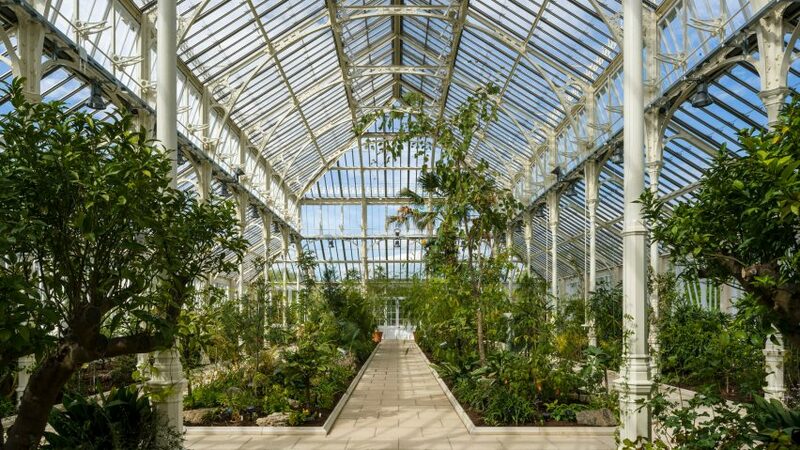 The Temperate House conservatory at Kew Gardens in Richmond upon Thames, London has reopened to the public following a five year restoration by Donald Insall Associates. The London-based firm, which specialises in consulting on historic buildings, was appointed as conservation architects by the Royal Botanic Gardens, Kew in 2012. A masterpiece of 19th-century design, the Grade I listed building is the largest surviving Victorian glasshouse in the world. Over 190 metres long, the plant house has a rectangular plan, with pitched roofs, stone columns and ribs of wrought iron. Designed and built by architect Decimus Burton in 1860, the Temperate House is home to 10,000 plants, many of which are rare or endangered species. In the 1970s it fell into disrepair, before being restored in the early 1980s. In 2003 UNESCO declared the Royal Botanic Gardens, Kew a World Heritage Site, but in 2012 English Heritage proposed placing the Temperate House on the Buildings at Risk register. The current restoration project is reported to have cost £41 million. "Every conservation technique has been realised in a way that retains the bold spirit of this elegant marriage of Victorian architecture and engineering," said Aimée Felton, associate at Donal Insall Associates and lead architect on the project. "We have also carried out our own painstaking research on Decimus Burton and the Temperate House taking samples of old materials and studying these carefully whilst working with the highly skilled craftsmen to ensure all interventions have integrity." A core component of Donald Insall Associates' brief was to adapt the building with modern technology that could improve the environmental control in the glasshouse, optimising air flow and light levels for the benefit of the plants. To facilitate the renovation work, most of the plants had to be carefully removed and stored elsewhere for safekeeping. Only nine trees remained in situ throughout the works, as they were deemed too horticulturally important to risk moving. In order to complete the re-painting and re-glazing of the glasshouse, 69,151 parts were dismantled, logged and stored. The team were equipped with tablets and used coding software to register each piece's original location. Each bit was cleaned with high-pressure water jets and crushed garnet blasting to remove corrosion, revealing the original casting marks and metalworkers' stamps. New stamps were added to the replacement lead work and the fresh casting on the snow guards and finial details. "New glazing, mechanical, ventilation systems, path and bedding arrangements all took their founding principles from Decimus Burton's own drawings, held within Kew's archives," explained Felton. Analysis performed on the structure's paint revealed the walls were originally decorated in a colour scheme of stone-coloured walls offset with blue and white decorative elements, before the white titanium dioxide was added in the 1950s. Donald Insall Associates chose a scheme of polychromatic stone colours for the re-paint, in reference to the original colourings. Many of the architectural elements included by Burton were innovative for the time. He is credited with being the first architect in England to use cement render, in order to speed up building process. As part of the conservation work, Donald Insall Associates restored the ornate methods employed by Burton to decoratively disguise the glasshouse's services, such as the ornamental cornucopia urns that his the chimney flues for the now redundant boilers. Entombed heating pipes were also retained and restored, although purely for historic purpose as they're now obsolete. "The time it will take for the newly propagated plants to reach maturity will offer visitors a full and unobstructed view of the incredible metal skeleton in all its glory: a cutting-edge sanctuary for plants," added Felton. Also in Kew Gardens is artist Wolfgang Buttress' Hive, a metal honeycomb pavilion that was first built for the Milan Expo in 2015 and then re-located to the botanical gardens as a permanent feature. Also to be found in the gardens is a curving bridge across a lake by John Pawson, called the Sackler Crossing.